Take your company, team, event, or anything you can think of to the next level of professionalism with a custom designed polo or sports shirt. Our premium printing and embroidery experts are at your service to help you create the perfect design and outfit for needs. 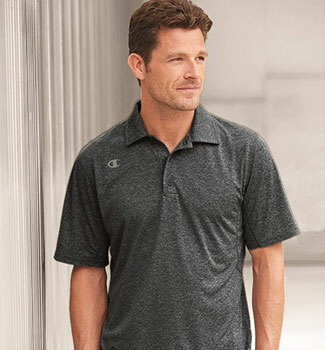 Typically made of cotton or other high-performance materials made to last, these collared knitted shirts are ideal for those business casual work days, a morning at the golf course, or when you’re feeling like dressing your look up. We carry a wide variety of colors, brands, patterns, fabrics, sleeve options, and more so you can have the custom designed polo of your dreams. We also carry multiple styles of each brand so we can develop the exact look you’re going for at an impeccable, professional level of quality. From the affordable to the most expensive, we won’t recommend a brand we don’t believe in. HOW DO WE PRINT OUR POLOS & SPORTS SHIRTS? Embroidery is by far the most popular printing option for custom polos and sports shirts. When applied to a knitted piece of apparel, it simply creates an undeniably high level of professionalism. Embroidery is also made to last, especially on the brands we offer. Expect your design to look great for years, no matter how often you show it off. For some polos or design needs, other printing methods can also be fantastic option. Specific artwork, narrow timelines and/or final quantity can assist us in determining the perfect printing technique. Embroidery is often the best choice when it comes to applying your artwork to a polo or sports shirt. Imagine how slick your logo, team, company name, etc. will look when seen on a high-end garment. We use countless brightly colored, top-quality threads to make a custom look that’s made to perform. The minimum order for embroidery is 25 garments and we will need at least 24-hours to complete. As a newer technology, Direct to Garment or DTG printing is the best way to get apparel printing done fast. However, it’s not the greatest option for most knitwear like polos. Some knit fabrics may work for your needs however, so do contact us if you’re interested in this option or need a quick turnaround time. As there is no minimum order, it is also ideal for small orders. Choosing a high-end tee or cotton piece of outerwear may better choice if you have these restrictions. Screen printing is the second most popular option for our polos and an ideal choice for many fabrics and custom design ideas. With bold colors and optimal versatility, talk with our design team to choose the right piece of apparel so you can show off your custom artwork right. Like embroidery, we require at least 24-hours to create and the minimum order is 25 garments. Heat transfers are great for creating custom numbers and names. However, most polos and sports shirts aren’t optimal candidates for heat transfers as they print best on mesh or polyester. Talk to our experts to determine what apparel is right for you, or check out our tees or outwear sections for shirts that do work well for heat transfers. The minimum order is 25 garments.